Many countries in the world have created their own version of a turnover-style pastry: a pasty in Great Britain, a calzone in Italy, a knish in Eastern Europe, or a Jamaican patty. We’ve tried all of these. They are surrounded with pastry – how can we turn that down? But the greatest versions of these tasty treats that we’ve found so far are created here in Bolivia. First are the fried cheese pasteles. Although in most of the country, these tasty treats are prepared mainly during Christmastime, in Oruro they are found in markets all year long, sold to accompany the maize drink called api. Two of our favorites are pasteles Navideῆos con queso, filled with quesillo from the state of Cochabamba, or pasteles Navideῆos con relleno, filled with beef. As I wander the streets of Oruro in the early morning, I comically try to eat my hot-from-the-oven pastele. It’s too hot to hold but too delicious to wait for. I continuously toss it from one hand into the other, taking tiny bites then fanning my open mouth to keep from getting 2nd degree burns. I just can’t wait. 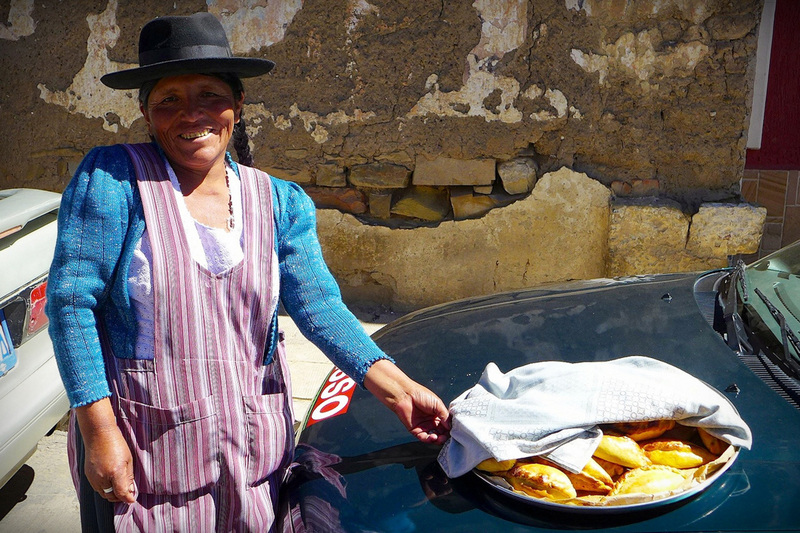 Second is our typical breakfast in Bolivia, salteῆas – crusty golden pastries filled with delicious flavour. Originating from Argentina, salteῆas are crammed with beef or chicken, olives, eggs, potatoes, onions, peas, carrots, raisins, and spices. The best ones ore freshly baked, juicy, and dribbling down our arms as we devour them. In the mornings, they are everywhere in this country, and each time we see them, we stop to try one. Mmmmmmm. You can find recipes for each of these tasty treats in My Mother’s Bolivian Kitchen: Recipes and Recollections.